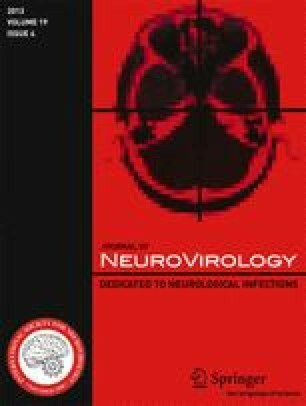 Antigen expression of a human endogenous retrovirus family, HERV-W, in normal human brain and multiple sclerosis lesions was studied by immunohistochemistry by three independent groups. The HERV-W multicopy family was identified in human DNA from the previously characterized multiple sclerosis-associated retroviral element (MSRV). A panel of antibodies against envelope (ENV) and capsid (GAG) antigens was tested. A physiological expression of GAG proteins in neuronal cells was observed in normal brain, whereas there was a striking accumulation of GAG antigen in axonal structures in demyelinated white matter from patients with MS. Prominent HERV-W GAG expression was also detected in endothelial cells of MS lesions from acute or actively demyelinating cases, a pattern not found in any control. A physiological expression of ENV proteins was detected in microglia in normal brain; however, a specific expression in macrophages was apparently restricted to early MS lesions. Thus, converging results from three groups confirm that GAG and ENV proteins encoded by the HERV-W multicopy gene family are expressed in cells of the central nervous system under normal conditions. Similar to HERV-W7q ENV (Syncitin), which is expressed in placenta and has been shown to have a physiological function in syncytio-trophoblast fusion, HERV-W GAG may thus also have a physiological function in human brain. This expression differs in MS lesions, which may either reflect differential regulation of inherited HERV-W copies, or expression of “infectious” MSRV copies. This is compatible with a pathophysiological role in MS, but also illustrates the ambivalence of such HERV antigens, which can be expressed in cell-specific patterns, under physiological or pathological conditions. The recombinants proteins used as standards in WB studies were produced and purified by Amplicon Express Inc., Washington DC, USA.